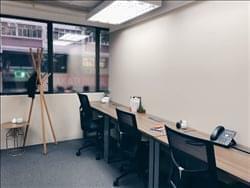 Find My Workspace lists over 95% of the serviced offices & coworking space market in Lockhart Road. Simply click Request Quote to check pricing for one office, or Add to Basket for multiple offices. This new Hong Kong location is conveniently situated opposite Wan Chai MTR, and within easy reach of the area’s many coffee and lunch spots. With co-working and private office options across two large floors, the building also features an extensive rooftop terrace alongside the premium event space. With on-site F&B, members have 24/7 access to the space and prices are all-inclusive of internet, meeting room use, printing, cleaning, tea & coffee, light snacks, beer & soft drinks, phone answering and mail-handling. This is an excellent space and one in which you are your business can thrive. To obtain information for your selected Lockhart Road Serviced Offices & Coworking Space, please tick the "Add to basket" box for each office you prefer and complete the form below. We will then send a detailed report via email.